This error message indicates that GrinPro miner failed to load because it couldn't find or initialize .NET Core 2.2.1 (or ASP.NET Core 2.2.1). This is however a bit strange as you say you can run it manually which indicates that you should have these packages installed already. If you open cmd.exe and execute the following two command, do you get the same error? Thanks. I will include this in the next release. Thanks for the update. 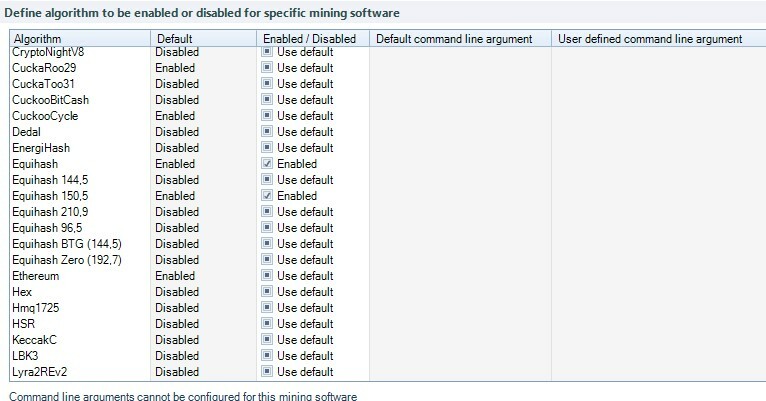 What you could do is to run the Antminer diagnostics in Awesome Miner just to see if that one gives any more details. Thanks - I will include this one in the next release. My understanding is that both CuckaRoo29 and CuckaToo31 uses a concept of Graphs per Second when reporting mining speed and that this is a number like 5 per second. So it's not Mega. Awesome Miner always uses the term H/s, no matter if some coins actually are based on concepts like Solutions per Second like Equihash. For this reason it makes most sense to show it like 5 H/s in Awesome Miner. Installed lightdm and switched to light dm, rebooted, Oc working. Mining working. Hi Patrike, two suggestions for the program. Another suggestion: THE exchange filter for each currency is fantastic, I can not express how much I thank you, it is very useful. I was wondering if when displaying the exchange list of a currency you would put in bold color, or with an Asterisk, or even that only the exchange would come out where you have data. Something to know at a glance by scrolling which exchanges we have data for that currency. If not, I have to go and look for that information elsewhere. But as you receive it by API, if it is in 3, highlight those 3, or put them first, or underline them, be as it is to highlight them of the rest of exchanges that do not have data of that currency. It would be even more functional. So if I use the command it comes up, receives about 6 shares and then gives the error. Now if I try Awesome Miner the command prompt pops up and then disappears instantly and then remote agent crashes then Awesome Miner says "service offline"
Well out of frustration I just did a clean install of Windows 10 and reinstalled everything from scratch. So far everything is running fine. It's strange that this happened in the first place. Sidenote: I attempted to inquire on another thread https://bitcointalk.org/index.php?topic=5090427.940 but the people there aren't in the least bit helpful. So thanks for your time and patience at least. @patrike or @mopiddo I have a problem. For days I have noticed that Bminer does not work well for me and I use other miners. Today reviewing optiona> managed software when entering Bminer, I see that it has some enabled by default, but they do not have the text of "A-l-g-o" does not put Cucka29, or tensory. But he does not let me put it manually either. If I enter any other miner, I see that if they have defined the "A-l-g-o" or I can define it manually, but it does not leave me. How can I fix this, right now I can not use Bminer in anything. About the notes field - I understand your point here, but it's a bit similar to the discussion we had about Pool Profit Factor where a pool property would be related to a coin. I think this will have to be part of a concept later on where you have a Pools tab in addition to a Coins tab.